Online Bingo Jackpots at Ladbrokes Bingo are part and parcel of the package deal offered to all players – Play Bingo in any game and it has a guaranteed jackpot fund, but you also have the chance to win the 33 Ball Escalator and 38 Ball Bonus. Play Bingo and if you get house in under 33 balls you can claim the progressive jackpot which starts at £5,000 and increases daily until it is won. You also have the chance to win £2,500 if you play online bingo and get house in under 38 balls. 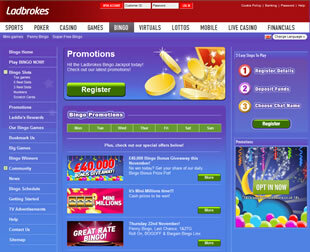 At Ladbrokes Bingo, your money can go a long way with their “cheap” bingo tickets. Every week there are over 700 games played with bingo tickets of either 5p or 10p. Want even “Cheaper” Bingo tickets? If you only want to play these bingo games then Tuesday morning is the session for you. Every Tuesday morning all tickets are either 5p or 10p and you could still win the 33 ball escalator which is now over £11,000 (correct at time of writing). One of the benefits of online bingo and in particular at Ladbrokes Bingo is you don’t have to miss out on chatting while the games are being played, play bingo set to auto dab and you won’t miss out on the game in play or the latest gossip. The online bingo chat rooms are managed by their fantastic team of Bingo Chat Moderators (CM’s). The CM’s not only help you get started and monitor the chat to make sure it’s Integrity is kept, they join in on the fun, as they love a good chat – that’s one of the reasons they have been employed (lol). And if you need some luck watch out for the lucky dust they sprinkle. Ladbrokes bingo chat team include Jessica, Dixie, Brian, Hannah, Lucy, Melissa, Kate and Dylan – and they are all waiting to meet you. Over and above the normal chitter chat the CMs also run the bingo chat games, currently there are 2 quizzes for you to test your knowledge – every Monday and Wednesday evening you can join in the quiz, and maybe you could be the next winner to get £50. Click here to visit Ladbrokes Bingo!